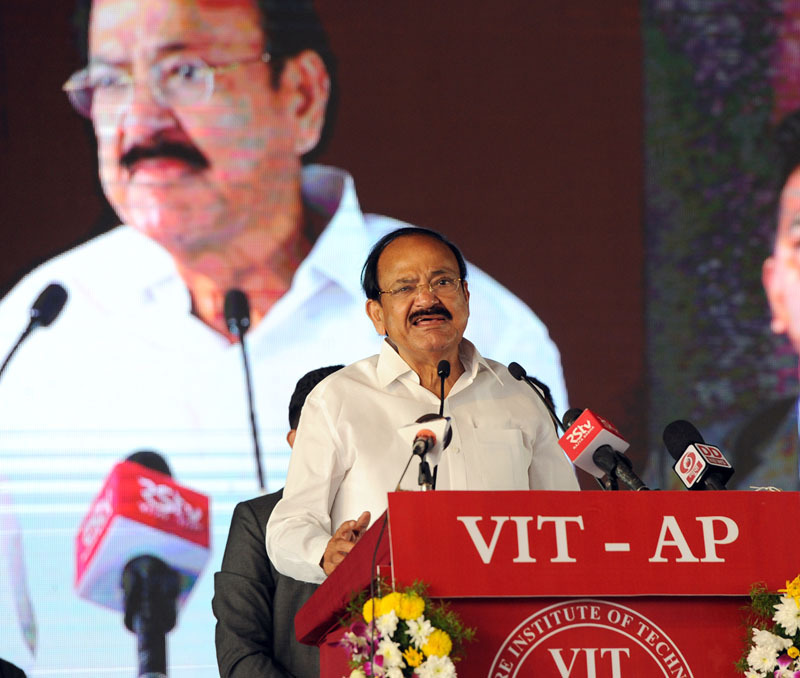 The Vice President, Shri M. Venkaiah Naidu addressing the gathering after inaugurating the new campus of Vellore Institute of Technology, in Amaravati, Andhra Pradesh on November 28, 2017. Vellore: The Vice President of India, Shri M. Venkaiah Naidu has said that education is the most powerful weapon which can transform the world. He was addressing the gathering after inaugurating the Andhra Pradesh Campus of Vellore Institute of Technology, in Amaravati, Andhra Pradesh today. The Chief Minister of Andhra Pradesh, Shri N. Chandarababu Naidu, the Mininster for Health and Medical Education, Dr. Kamineni Srinivas and other dignitaries were present on the occasion. 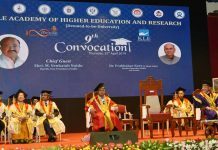 The Vice President said that educational institutions are the temples of learning and every student, who steps into them, must not only show respect to the Gurus, but also display complete dedication and discipline towards the entire process of learning. He further said that as per our ancient Guru-Shishya parampara, the teacher is the most venerated person by the disciple. Although modern day students get all the information they require at the click of a mouse by going to Google, it should be noted that Google can never replace a Guru, he added. The Vice President said that he firmly believed that Education is for Emancipation, Enlightenment, Empowerment, Employment and Empathy. He further said that education should become a powerful tool of social, cultural and economical transformation of the country with strong moral and ethical values forming the basis of such a transformation. Technology is changing so rapidly that students not only need to anticipate the future requirements but must be able to develop the technologies of tomorrow, he added. The Vice President said that India is also now in an advantageous position with 65 per cent of the population below 35 years. Higher Educational institutions and universities have a crucial role to play in unleashing their energies and realizing the demographic dividend, he added. • TRANSFORMATION of the students entering this institute. ” I am extremely delighted to inaugurate the new campus of Vellore Institute of Technology (VIT) in Andhra Pradesh’s new capital, Amaravati, which is envisaged to be developed into an educational hub by the Andhra Pradesh Government. VIT is one of the top educational institutes in the country and has carved a niche for itself in providing quality learning to students. Merely having grand and swanky buildings will not make an institution famous. It is the quality of education, the presence of good faculty, right ambience and ecosystem for students to unleash their creativity and genius are important. VIT has an impressive record on this score, I believe. Educational institutions are the temples of learning and every student, who steps into them, must not only show respect to the Gurus, but also display complete dedication and discipline towards the entire process of learning. As per our ancient Guru-Shishya parampara, the teacher is the most venerated person by the disciple. Although modern day students get all the information they require at the click of a mouse by going to Google, it should be noted that Google can never replace a Guru. As the Indian Education Commission of 1964-66, also known as the Kothari Commission, had stated that the destiny of our country is being shaped in our classrooms. No doubt, the knowledge, skills and attitudes acquired by students form the basis for nation building. Education should become a powerful tool of social, cultural and economical transformation of the country with strong moral and ethical values forming the basis of such a transformation. As a result of several initiatives taken by successive governments with the goal of ensuring ‘Education for All’, the country has several hundred universities. But numbers are not important, what matters is the quality. There is every need for the institutions of higher learning to raise the standards, improve methods of pedagogy, enhance research activities and form greater linkages with the industry so that the students are well equipped to face the challenges of a globalised world in which digital technologies are playing a leading role. Basically, the universities must produce multi-skilled students of tomorrow and for that to happen, the varsities must convert themselves into centres of excellence. The Industries must also come forward to fund research activities in universities. India has a rich and glorious tradition of learning which focussed on the development of the inner self of the student. The education system developed by the British was aimed at serving them rather than benefiting the country. At the time of Independence, India had only around 20 universities and 500 affiliated colleges with a meager enrolment of less than one lakh students. The education system of those days was narrow and elitist. Today, India’s higher education system is the third largest in the world, next to only the United States and China. As per the latest reports available, India has around 760 Universities, 38,498 colleges and 12,276 standalone institutions with a total enrolment of around 3.4 crore students. The Government has taken many initiatives to transform the higher education sector with the motto of “Education for All and Quality Education”. Several new institutions have been started during the last two and half year, including 6 new IITs, 7 new IIMs, 8 IIITS and other highly esteemed institutions across the country. A National Ranking System (National Institutional Ranking Framework – NIRF) has been developed to promote competitive spirit among the institutes and help the students make an informed choice. I am told that VIT has topped the ranking consecutively for past two academic years among private engineering institutions in India as per NIRF Ranking. My compliments to you. India is today among the large economies and the country’s GDP is expected to touch 7.5 per cent in the coming years due to the reforms taken by the government. India is also now in an advantageous position with 65 per cent of the population below 35 years. Higher Educational institutions and universities have a crucial role to play in unleashing their energies and realizing the demographic dividend. It is for these institutions and students to ensure that India earns a rightful place in the technological field and the world economy. It is also important for every education institution to create an atmosphere which encourages innovation, new ideas and tap the talent of the young minds. Education is the most powerful weapon which can transform the world. And to keep up with this change, learning should not be seen as an end but as a means to achieve greater heights in life. You should become multi-skilled and dare to dream big to achieve your goals. I would like to compliment Chief Minister, N. Chandrababu Naidu for inviting top education institutions from India and abroad to Amaravati with a vision to transform the State into an education and knowledge hub of global standards. In a bid to encourage innovations, universities and higher education institutions have to set up innovation clubs on their campuses. Dear students, India is an old land but a young nation. It is your skill, capability and knowledge that would drive this young nation forward in the march towards development. Once again, I congratulate VIT-AP on this joyous occasion and wish all the best for your future endeavours. TRANSFORMATION of the students entering this institute.